and from there it gets more and more nightmarish, anarchic and nasty. Told from the perspective of a young man seemingly content to drift through life, the text is sharp, concise and knows when to drop a startling, sickening observation on the madness that ensues. Although there are only 11 pages, this truly is a showcase on how to get readers locked into a story. The horror is bloody, disturbing and visceral - I found myself turning pages and wondering how much more perverse and gory it could get. That is a recommendation, by the way. Great way to end the issue as well. Burrows art keeps up with the manic thrills and does a good job of illustrating a towns descent into hell. 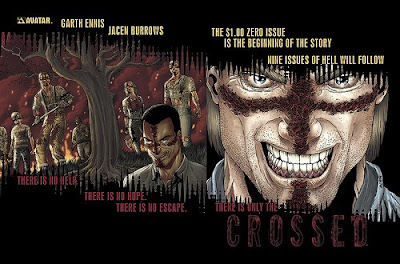 As horrific and post-apocalyptic as it gets, Crossed is on my pull list, joining the likes of Kirkman's 'The Walking Dead' and Guggenheim's 'Resurrection'. 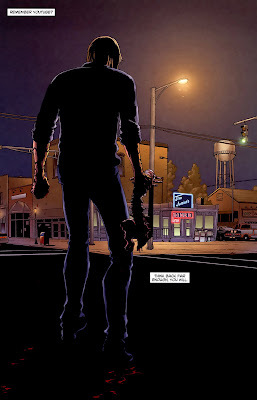 Only thing is that it's a Garth Ennis comic and not Warren Ellis.